As momentum continues to slowly ramp up in the offshore sector, Horizon Maritime said it has grown its fleet with the addition of another multifunctional offshore support vessels (OSV) from Houston-based Tidewater Marine. 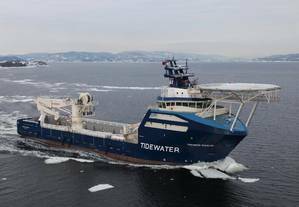 The new vessel, Tidewater Enabler, joined Horizon's fleet in August and is capable of supporting various specialized marine applications, the company said. The OSV is designed for operations in harsh weather conditions and features a 100-metric-ton/2,000-meter subsea crane, can house two work class remotely operated underwater vehicles (ROV), has a large deck space of more than 900 square meters, and provides large offshore accommodation capacity. The vessel recently completed a job to remove oil from the wreck of the Liberian-flagged paper carrier Manolis L, which ran aground and sunk near Change Islands in Notre Dame Bay, Newfoundland in 1985. Horizon Maritime said it is also working with Tidewater Marine in Atlantic Canada operating two vessels, the Troms Sirius and Lundstrom Tide. The two companies supported Shell Canada's Shelburne Basin Deep-Water Exploration Project, importing and operating the Breaux Tide and Jones Tide in 2015 and 2016.